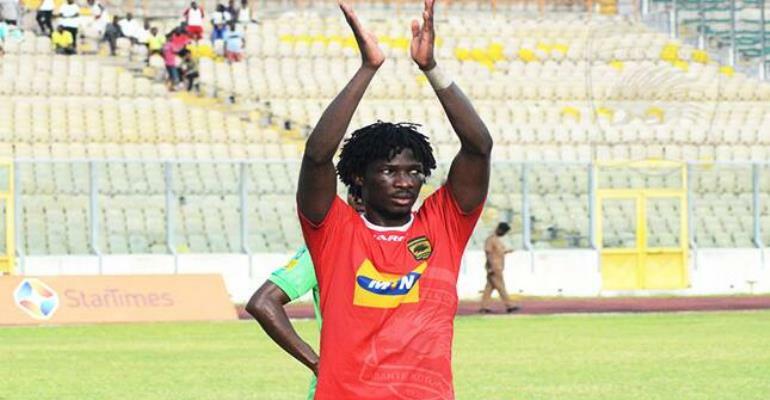 Accra Representative of Asante Kotoko, Nana Kwame Dankwa has revealed that management of the club have agreed to allow Burkinabe forward Sogne Yacouba to leave the club if the right offer comes. Sogne Yacouba is believed to have told the club he wants to leave after failing to progress to the quarterfinals of the CAF Confederations Cup. According to sources close to the player, clubs from Czech Republic and Portugal have began talks with the players representatives. “We've agreed in principle to let Yacouba Songne leave but as we speak, Asante Kotoko hasn't received any offers though his agent claims otherwise. "He'll continue to honour the 1 year left on his contract till the club receives a good offer," Nana Kwame told Sikka Sports. The Burkinabe forward has been in stupendous form for the Porcupine Warriors this season, helping the Kumasi based club reach the group stages of the CAF Confederation Cup for the first time in eleven years. The former Stade Malien forward has also attracted interest on the continent, with seven times Africa champions Al Ahly reported to have tabled an offer of $1.5 million. Sudanese giants Al Hilal and Al Merreick has also shown interest in the attacking beast.